Bearing all this in mind, I spoke to a friend of mine, Kim Parker, several months ago, who is one of the beauty editors at a leading European fashion magazine and who also worked as a beauty editor at Vogue for several years and asked for her help… I then completely forgot about it with traveling around the world, moving house and coping with pregnancy I just forgot… until a few nights ago, when I was chatting to her on Facebook and she asked if we still wanted the article…. OMG YES was my reply and literally, then and there she typed this out for us…. our very own tailor-made for this climate guide and hence yours too to getting the very best bridal beach make-up and as a result the very best Beach Wedding Photos…. Ok, so tips about how to look natural glowy and gorgeous in wedding pics, taking into account digital photography and hot weather…. 1. I don’t like to think there are many hard and fast rules with wedding makeup, but if I had to pick one, it would be to think ‘naturally glowing and gorgeous’. 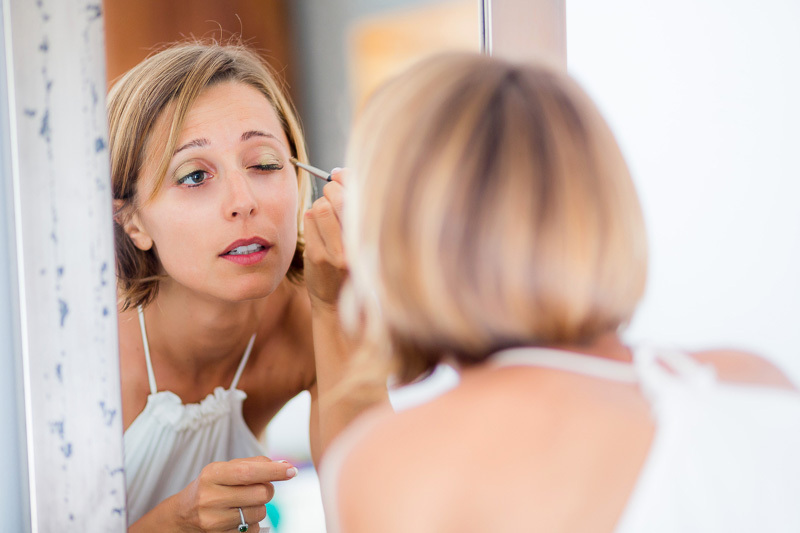 It’s your big day, so of course you want to look like your prettiest self. But big, obvious makeup ‘looks’ quickly date (ditto that for overdone hair) and advances in digital photography mean that lighter, fresher makeup looks fare better than the heavier ‘pancake’ makeup of the past. 2. With hot weather, the key is to think light layers of makeup that will still let your skin breathe. Yes, you’ll have to do a few more touch-ups than you would have with the thicker, chalkier makeup formulas of yesteryear, but the result will be prettier and much more natural. The best news? Modern makeup formulas have come on so fast in the last couple of years, there’s a plethora of whisper-light makeup textures, from foundations to eyeshadows and lipsticks that will still give great coverage but feel and look truly natural. 3. I like to start with freshly moisturised skin – a smooth canvas means anything you apply on top will look super fresh. Olay and SKII make wonderful serum-soaked cloth masks that are literally like a skin drink. Clarins and Eve Lom also make great moisture masks, and I love Sisley’s Radiant Glow Express mask for a fresh glow in mere minutes. 4. Once skin is clean and prepped, smooth on one of the new skin primers. They’re a world away from the old cloying silicone-filled primers of a few years ago. The newest ones are light, infuse skin with skincare benefits and can help your makeup really go the distance. I love Australian brand Becca, and their Radiance Primer is a total must (in fact, I love all their glow-giving makeup). Revlon’s Photoready Primer is excellent, YSL Top Secret Primer smells incredible and Nars contains a proper SPF of 30, which is useful for hot weather weddings. 6. For the day, pack blotting papers or powdered blotting sheets to whisk away shine without smudging makeup or leaving skin looking ‘dusty’. The best I’ve found are by MAC, Paul & Joe (in the prettiest packaging) or Serge Lutens. 7. Don’t underestimate the power of a touch of blush. It instantly perks up your skin and can make you look like you’ve had 8 hours sleep (even if you haven’t!). Powder blushes will last in the heat but I like a touch of cream or gel blush blended into skin with fingers – it really makes the glow look like your own. Check out Bobbi Brown Pot Rouge, Becca Beach Tints, Max Factor Miracle Touch Creamy Blush and Stila Convertible Colour. 8. A light dusting of bronzer on top of blush can be great to contour and warm skin, if needed. 9. Highlighter is really useful for adding instant freshness and it looks beautiful patted onto browbones, tops of cheekbones, the very inner corner of the eyes and on top of the cupid’s bow. Try something like MAC Cream Colour Base in Pearl. I would add that if you’re using shimmer, stick it placing it on one or two features only. Say, using it on eyes and lips and keeping skin velvety. Going overboard with shimmer and shine can leave you looking like a glitterball or, worse, really sweaty. It’s more modern to have a mix of textures. 10. With eyes, why not try something fresh and pretty for a day time ceremony and then smoking things up for the nighttime partying. Loads of eye makeup during the day can end up melting and looking messy (strangely though, a little smudged smokey eye at night can look really amazing). For daytime, I like using neutral eyeshadow shades from Bobbi Brown, Urban Decay and Stila. 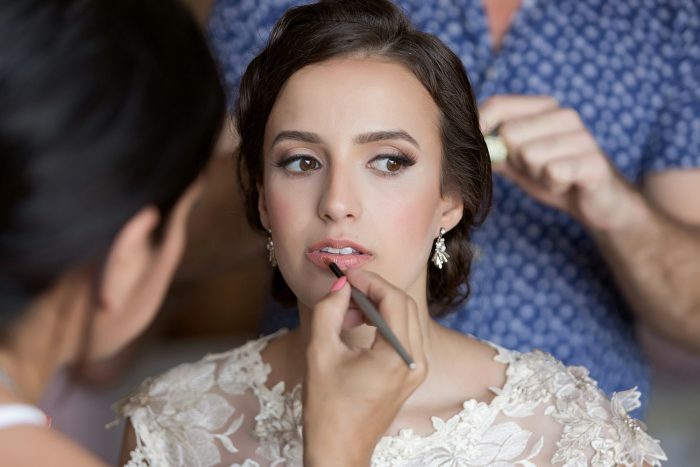 Take inspiration from the bride’s skin tones (or your own, if you’re the bride!). Pale golds, rose-golds and even bronzes are great new neutrals too. If you like, add a fine flick of liquid liner on the upper lid(try MAC Penultimate liquid pen liner or MAX Factor Masterpiece Glide & Define) [Dean : but please please please and I can’t stress this enough, dont use eyeliner on your lower lid it stops all the light getting into the eye and looks really bad photos in the very white light we get here in Mexico] . Finish with waterproof mascara (in case of tears, or ending up in the sea…). I like Max Factor False Lash Effect waterproof, YSL Faux Cils waterproof, Lancome Hypnose waterproof and MAC Zoomfast waterproof. 11. Lips should be the last thing you do before you head out to the ceremony. It gives the bride (or you!) a chance to eat, drink, kiss, practice lines, etc. without fear of smudging or wearing away. Take inspiration from lips natural shade (or you can go for a pop of red or pink if this is truer to your signature look! After all, you need to look like yourself!). I like the new creamy, balm-like textures that have appeared lately. They have great pigment and feel super light, never tacky. Some of the best are Clinique Butter Shine, Bobbi Brown Creamy Lip Colour, YSL Rouge Pur Couture Glossy Stain (a long lasting balm-stain with an amazing texture), Poppy King Lipstick Queen, Laura Mercier Sheer lip colour and Becca Beach Tint. If you must use gloss, use a tiny touch in the centre of your bottom lip for shine and don’t overdo it – the groom (or, your groom) wants to kiss your lips, not a lot of gloss! 12. Lastly, have an amazing wedding day! Of course, you’ll look wonderful but don’t forget, it’s about much more than that – it’s about taking the next step in life together.